Co-operatives and Mutuals Canada (CMC) congratulates Monique F. Leroux on her election as President of the International Co-operative Alliance (ICA). Ms. Leroux was nominated by CMC and her candidacy received the support of our members. The election was held during the ICA Global Conference in Antalya, Turkey, on November 13. Ms Leroux was elected to serve the remaining two-year mandate of outgoing President Dame Pauline Green who is retiring after six years of service to the co-operative movement. Ms. Leroux was elected from a competitive field of four candidates, the most ever to seek the position in the organizations 120-year history. "The entire Canadian delegation joins me in congratulating Monique Leroux on her election. There was a great field of candidates for the ICA presidency and she should be very pleased with her victory" stated CMC President Jack Wilkinson upon hearing the results. "Canada has a long tradition of co-operative values and is a big supporter of the ICA. With Monique Leroux at the helm we have confidence that the ambitious goals of the Blueprint for a Co-operative Decade will be accomplished" concluded Mr. Wilkinson. Monique F. Leroux served on the founding board of CMC with Jack Wilkinson in 2014 and was part of the team that negotiated the historic coming together of the Francophone and Anglophone national co-operative associations in Canada in 2013. Ms. Leroux is also the past President of Conseil québécois coopération et mutualité and under her leadership, co-operative and mutual networks in Quebec launched an integrated strategic plan for co-op development. 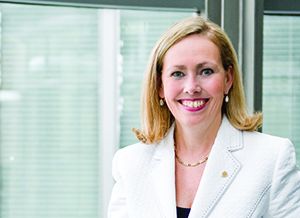 As President and CEO since 2008, Monique Leroux has championed the Desjardins Group and other Canadian co-operatives both nationally and internationally. Under Ms. Leroux’s leadership, Desjardins co-hosted the International Summit of Co-operatives in Quebec City in 2012 and 2014 with a 3rd Summit planned for 2016. As the largest financial co-operative group in Canada with one of the strongest balance sheets in the world, Desjardins ranks as the 5th largest financial co-operative according to the World Co-operative Monitor. Ms. Leroux will step down as head of the Desjardins Group in April 2016. Monique Leroux is the first Canadian ever elected as President of the ICA. To learn more about Ms. Leroux’s plans and priorities, please read her full platform at moniqueleroux.coop. About CMC: Co-operatives and Mutuals Canada is the national, bilingual association for co-operatives and mutuals in Canada. Through advocacy with the federal government, CMC provides a knowledgeable voice committed to improving the economic and regulatory environment for co-operatives and mutuals on behalf of our members. CMC's members come from many sectors of the economy, including finance, insurance, agri-food and supply, wholesale and retail, housing, health, forestry, education, funeral services, public utilities and community development. CMC provides leadership to support, promote, and develop the co-operative economy in Canada. The co-operative and mutual movement in Canada counts more than 18 million memberships from approximately 9,000 co-operative and mutual enterprises.